Recommended Citation: Lee, S, M R Mehta, and J R Shah. Test Driven Development in the .Net Framework. In The Proceedings of the Conference on Information Systems Applied Research 2008, v 1 (Phoenix): §4113. ISSN: 0000-0000. Test Driven Development (TDD) is powerful to create and maintain complex packaged software for enterprises. The .Net framework and the test-first approach provide synergy for developing high-quality database applications in the fast-changing business world. 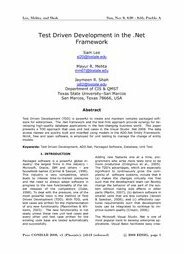 This paper presents a TDD approach that uses unit test cases in the Visual Studio .Net 2008. The data access classes are quickly built and modified using models in the ADO.Net Entity Framework. NUnit, free and open software, is employed for unit testing to manage the change of entity models.